Myeloid-derived suppressor cells (MDSC) contribute to immune dysfunctions induced by tumors both in experimental models and patients. In mice, MDSC are phenotypically heterogeneous cells that vary in their surface markers, likely depending on soluble factors produced by different tumors. We recently described a subset of inflammatory monocytes with immunosuppressive properties that can be found within the tumor mass, blood, and lymphoid organs of tumor-bearing mice. These cells expressed the α-chain of the receptor for IL-4 (IL4Rα) that was critical for their negative activity on CD8+ T cells. In cancer patients, the nature of MDSC is still poorly defined because evidence exists for both monocytic and granulocytic features. We show in this study that myeloid cells with immunosuppressive properties accumulate both in mononuclear and polymorphonuclear fractions of circulating blood leukocytes of patients with colon cancer and melanoma, thus unveiling a generalized alteration in the homeostasis of the myeloid compartment. Similarly to mouse MDSC, IL4Rα is up-regulated in both myeloid populations but its presence correlates with an immunosuppressive phenotype only when mononuclear cells, but not granulocytes, of tumor-bearing patients are considered. The existence and relevance of an immune response against tumor cells have been discussed for many years. It is now clear that the immune system can react and sometimes plays an important role in tumor control, both in animal models and patients. The basis of this response lays in the existence of tumor-associated Ags (TAA)4 and their ability to elicit an Ag-specific response. The molecular identification of TAA has opened new possibilities for the development of effective immunotherapy of cancer. In recent years a large number of clinical studies were undertaken, but so far they have shown a limited impact in terms of clinical benefit (1). Reasons for these disappointing clinical results are multifactorial and still largely unknown, but some mechanisms responsible for the lack of response in cancer patients are emerging. Among them, active suppression of the immune response has been confirmed by several preclinical and clinical studies (2). Myeloid-derived suppressor cells (MDSC) represent a phenotypically heterogeneous population of myeloid cells at different stages of maturation found in tumor-bearing mice and in cancer patients that very efficiently suppress T cell function (3). Most likely, the heterogeneity reflects the plasticity and versatility of the myeloid precursors in response to signals received from the tumor microenvironment. It is known, in fact, that a growing tumor stimulates myelopoiesis and affects cell differentiation through the production of growth factors and cytokines (3). The characterization of human MDSC has been attempted in recent years with conflicting results. Earlier reports indicated that human suppressor cells were present as a heterogeneous population containing immature monocyte/dendritic cells, and cells encompassing earlier myeloid differentiation stages in the peripheral blood of patients with squamous cell carcinoma of the head and neck, breast cancer, and nonsmall cell lung cancer (4). Subsequently, the existence of suppressor myeloid cells containing the arginine-metabolizing enzyme arginase (ARG) was reported in renal cell carcinoma patients and the increased ARG activity was shown to be limited to a specific subset of cells with polymorphonuclear morphology and surface markers (5). Of interest, ARG1 isoenzyme is constitutively expressed in human granulocytes and its activation results in suppression of T cell proliferation and cytokine synthesis (6, 7). In partial disagreement with previous observations, MDSC were recently identified as a subset of CD14+ HLA-DR−/low cells in PBMC of metastatic melanoma and hepatocellular carcinoma patients (8, 9) that could be expanded in blood after administration of GM-CSF-based vaccines (8), and be responsible for the induction of a population of T regulatory lymphocytes (9). Overall, although there is evidence for the presence of MDSC in different human cancers, their precise characterization is still elusive. One basic aspect, which needs to be clarified, is whether human MDSC should be searched among cells carrying markers, morphology, and physical properties of either monocytes or granulocytes. In the present study, we evaluated the phenotype and the suppressive activity of leukocyte subsets freshly isolated from the blood of melanoma and colon cancer patients. Our results indicate that cells with characteristics of MDSC can be found in both mononuclear and polymorphonuclear fraction, and that a useful marker for their identification is the α-chain of IL4R. After obtaining informed consent, fresh blood and biopsy samples from untreated patients were collected during surgery from melanoma metastases (Stage III–IV; n = 14) and colon carcinomas, with or without liver involvement (Stage II–IV; n = 15), and immediately analyzed. Blood samples were also obtained from healthy volunteers (n = 20). Frozen PBMC from four melanoma patients (Stage IV) were also used for flow cytometry analysis and proliferation assay. PBMC and polymorphonuclear cells (PMN) were isolated from the peripheral blood of healthy donors and cancer patients by density centrifugation followed by dextran sedimentation and lysis of contaminating RBC. In brief, blood was collected in EDTA-treated tubes, diluted 1/2 with RPMI 1640 medium, and carefully layered onto a density gradient Ficoll-Paque (GE Healthcare). After centrifugation, the bands of PBMC and PMN were aspirated; PBMC were washed three times with ice-cold PBS containing 1% of human serum, while the neutrophilic/RBC pellet was mixed with dextran 1% and incubated in upright position for 20 min at room temperature. The upper leukocyte-rich and RBC-poor layer was aspirated; to remove residual RBC, cells were subjected to hypotonic lysis by resuspending neutrophil/RBC pellet in 3 ml 0.2% NaCl for 2 min and by adding 7 ml 1.2% NaCl to restore isotonicity. Cell purity was checked by FACS analysis on forward scatter/side parameters, and viability by Trypan blue dye exclusion. PMN yielded purity and viability of >95%. CD14+ cells were immunosorted from PBMC with CD14 microbeads (Miltenyi Biotec). A postsort cytofluorimetric analysis was performed to confirm purity of each population. The allogeneic MLR was performed with a total of 7.5 × 104 PBMC from a healthy donor (responder cells) and combined with 7.5 × 104 gamma-irradiated (3,000 rads) cells from either PBMC, PMN, CD14+, or CD14− sorted cells from healthy volunteer or cancer patients (stimulator cells), and plated into a 96-well round-bottom tissue culture plate (BD Biosciences). To determine the potential immunosuppressive activity of PMN, different numbers of gamma-irradiated PMN were added as third part to an allogeneic MLR in which PBMC stimulators were autologous to added PMNs. The MLR was incubated at 37°C and 5% CO2 for 6 days in arginine-Free-RPMI (Biological Industries), supplemented with 150 μM arginine and further supplemented with 10% FCS, penicillin/streptomycin, and HEPES. All cultures were labeled with 1 μCi/well of 3[H]-TdR (PerkinElmer) for the final 20 h of the incubation period and were harvested on a 96-well plate harvester (PerkinElmer). Incorporated radioactivity was measured in a beta scintillation counter (Top Count, PerkinElmer). T cell proliferation was also measured by changes in fluorescence intensity using CFSE (Invitrogen, Molecular Probes). Thawed PBMC were resuspended in PBS 0.1% FBS at 2 × 107 cells/ml and incubated with CFSE at a final concentration of 0.5 μM for 10 min at room temperature on a shaker. Cells were washed twice and after the last wash step, PBMC were resuspended in culture medium. CFSE-labeled PBMC were depleted of CD14+ cells with CD14 Microbeads. Responder cells (CFSE-labeled CD14− cells) were cultured alone or in the presence of gamma-irradiated CD14+ cells in 96-well flat-bottom plates previously coated with 1 μM CD3-specific Ab OKT3. After 4 days, cells were harvested, stained with CD3-allophycocyanin (Immunotools, Germany) and CFSE signal of gated lymphocytes was analyzed by flow cytometry. The extent of cell proliferation was quantified by ModFit LT software V3.0 provided by Verity Software House. The following mAbs were used: CD14-PE and CD-15-FITC (BD Biosciences); CD14-APC, (BioLegend); IL4Rα-PE (CD124) and isotype control by R&D Systems. Data acquisition was performed using FACScalibur flow cytometer (BD Biosciences) and analyzed using CellQuest (BD Biosciences) and FlowJo (Tree Star). Exact one-sided Mann-Whitney U test was used to compare the percentage of CD14 or CD15 positive cells among groups of healthy donors vs colon cancer or melanoma patients, the stimulation index of CD14− cells in healthy donors vs cancer patients, and the percentage of inhibition by PMN in MLRs set-up with stimulating PBMC from healthy donors or cancer patients. Pearson correlation was used to measure the correlation between IL4Rα+/CD14+ cells or IL4Rα+/CD15+ cells and stimulation index ratio or percentage of inhibition, respectively. Results were considered statistically significant with p < 0.05. All the statistical analyses were performed using SPSS software ver. 14 (http://www.spss.com). In recent years a number of reports have suggested the presence of human MDSC in the blood of cancer patients, indicating MDSC either as monocytes, or cells with markers and morphology of polimorphonuclear granulocytes (4, 5, 8). To take into accounts all the possible sources of MDSC, we investigated the potential suppressive activity of different subsets of leukocytes isolated from the blood of melanoma and colon cancer patients, including freshly isolated PMN. To assess MDSC function, we set-up MLRs in which gamma-irradiated PBMC, CD14+, CD14− and PMN were added as stimulator to responder PBMC derived from healthy donors. These experiments showed that there are two main subpopulations endowed with suppressive activity in the blood of cancer patients: one is present among CD14+ monocytes, whereas the second can be found among PMN (Fig. 1⇓). We observed, in fact, that MLRs stimulated with PBMC of cancer patients depleted of CD14+ cells had a significant increase in proliferation rate, as compared with MLRs in which the CD14-depleted fraction from healthy donor PBMC was used (p = 0.031), suggesting that cells with immunosuppressive activity are present among CD14+ monocytes (Fig. 1⇓A). It should be noted, however, that monocyte removal in some cancer patients did not result in any change in stimulatory activity, as observed in healthy donors, indicating a patient-to-patient variability. Immunosuppressive activity of leukocyte fractions isolated from cancer patients or healthy donors. A, Fold increase in proliferation of responder PBMC of an healthy donor stimulated with gamma-irradiated PBMC (fold increase = 1), or with gamma-irradiated PBMC depleted of CD14+ isolated from colon cancer and melanoma patients (▪) or in healthy donors (□). Results are expressed as a stimulation index ratio (S.I.) where S.I. ratio is equal to the counts/minute in cultures stimulated with CD14− cells divided by counts/minute in cultures stimulated with unsorted PBMC. B, Inhibition of MLR proliferation by addition of PMN. Values are presented as inhibition of the allogeneic MLR set-up with PBMC responder cocultured with stimulating PBMC from cancer patients or healthy donors (1:1 ratio) in the presence of different dilutions of PMN. The figure represents the mean of five independent experiments ± SE. 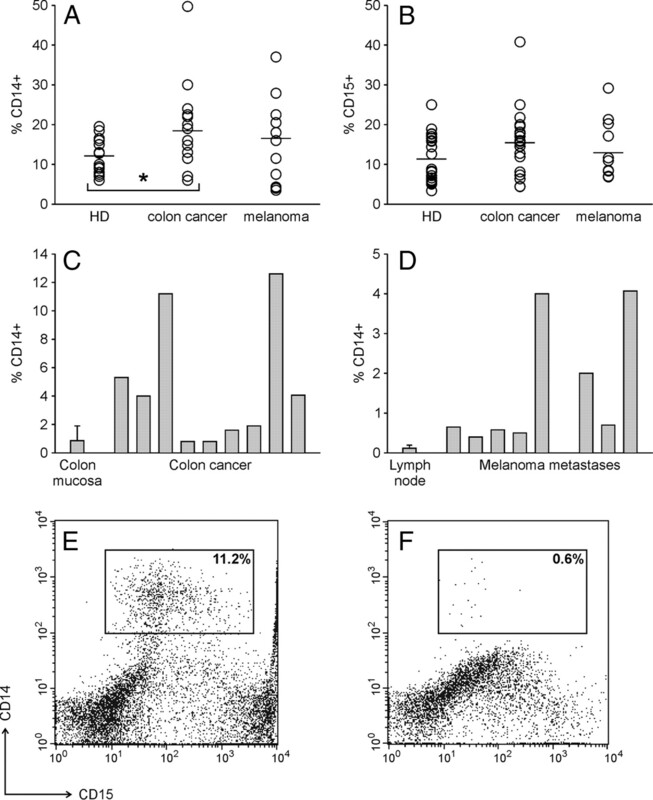 Inhibition with PMN from colon cancer and melanoma patients (▪) or healthy donors (□). ∗, p = 0.016. As expected, MLRs performed with PMN as stimulator showed a very low proliferation rate (data not shown). This limited proliferation could be due to different mechanisms: PMN might either be poor APCs or have a cytotoxic potential, due to granule content that can be discarded in the medium. Alternatively, they might exert an active immunosuppressive activity, as advanced by Zea et al. (5). 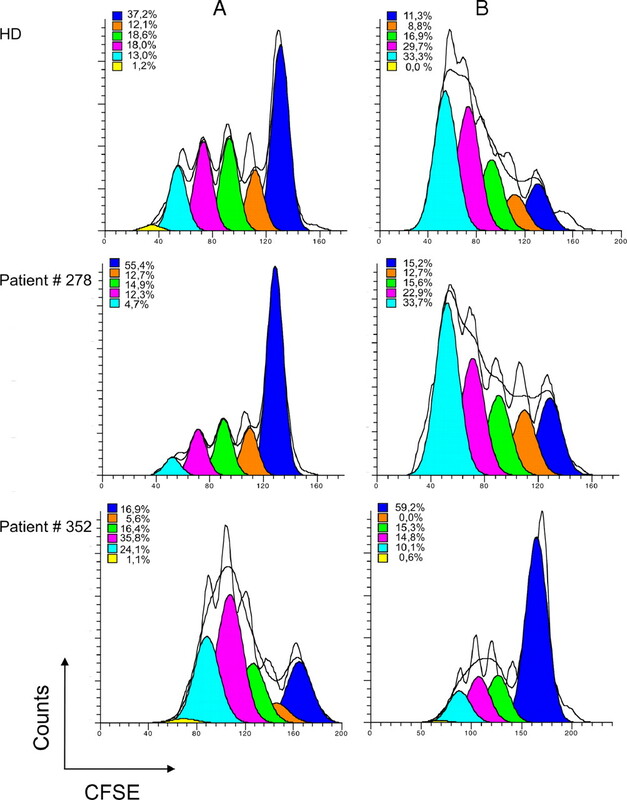 To explore the immunoregulatory potential of PMN, we added different amounts of gamma-irradiated PMN from either healthy donors or cancer patients, as third part, to an MLR set-up with responder PBMC from a healthy donor stimulated with gamma-irradiated PBMC from either healthy donors or cancer patients, respectively. Although PMN of healthy donors never showed the ability to reduce significantly MLR proliferation, PMN separated from cancer patients were able to decrease the proliferation of the responder PBMC in a cell concentration-dependent manner, therefore suggesting that an active mechanism of immunosuppression is also exerted by freshly isolated PMN of cancer patients (Fig. 1⇑B). Recently, a population of blood-circulating CD11b+Gr-1+ inflammatory cells expressing IL4Rα was described in tumor-bearing mice. In different tumor models, IL4Rα was recognized as a marker for discriminating populations of immunosuppressive monocyte-like MDSCs, from nonsuppressive IL4Rα− cells, which were mostly granulocytes (10). We investigated the expression of IL4Rα in different fractions of human leukocytes with mAbs directed against IL4Rα, CD14, and CD15. As most of the receptor for the cytokines, the staining for IL4Rα has a low intensity so we calculated the proportion of the positive cells by subtracting out those cells whose fluorescence lies under the control isotype curve. In healthy donors, IL4Rα-positive cells are present among lymphocytes and monocytes and we calculated that IL4Rα+/CD14+ cells comprise 7.3 ± 4.6% of PBMC (range 1,2–17.5%, Fig. 2⇓A, HD column) whereas 3.6 ± 4.2% of CD15+/IL4Rα+ cells are present among PMN (range 0–12,9%, Fig. 2⇓B, HD column). Expansion of IL4Rα expressing cells in monocytes and granulocytes. PBMC (A) and PMN (B) from healthy donors, colon cancer or melanoma patients were purified as described in Materials and Methods and labeled with CD14, CD15, and IL4Rα or isotype control. To calculate the percentage of IL4Rα among monocytes, cells were gated in the monocyte-gated region and positive cells were considered the IL4Rα+/CD14+ cells after subtraction of the background measured with the isotype control of IL4Rα. To obtain the percentage of IL4Rα among granulocytes, cells were gated in the granulocyte-gated region and IL4Rα+/CD15+ cells were calculated after subtraction of the background. C, Representative example of PBMC and PMN from an healthy donor (HD), melanoma patient 674 and melanoma patient 583 labeled with CD14, CD15, and IL4Rα and analyzed by cytometry as described. MFI, mean fluorescence intensity. When we characterized the IL4Rα-expressing leukocyte subpopulations freshly isolated from cancer patients, we observed in some patients a significant increase in the percentage of myeloid cells bearing the IL4Rα, both among PBMC and PMN (Fig. 2⇑, A and B, respectively). A representative example of the staining of this Ag in both PBMC and PMN is shown in Fig. 2⇑C. Frozen PBMC were also evaluated from four melanoma patients, and these samples showed values of IL4Rα+/CD14+ cells in line with the results obtained with PBMC freshly isolated, indicating that the expression of this Ag is maintained in thawed cells (data not shown). Unfortunately, PMN freezing results in extensive cell death, and therefore their phenotype and functional activity can only be evaluated with freshly isolated cells. Interestingly, there was not a strict concordance between PBMC and PMN in the same patients, because the levels of IL4Rα could be high in PBMC but not in PMN and vice versa, suggesting that the expansion of IL4Rα+ cells might be unrecognized in some patients if only Ficoll-purified PBMC were studied. The expansion of this IL4Rα+ myeloid population could be observed in cancer patients from stage II to stage IV, confirming findings from other groups (11). These results therefore support the notion that an expansion of myeloid cells bearing a marker of MDSC can be found in the mononuclear and polymorphonuclear compartments. In some healthy donors and cancer patients we recovered enough cells to perform both immunostaining and functional analysis. We thus correlated the percentage of IL4Rα+ cells found in PBMC and PMN with the suppressive ability observed in MLR experiments (i.e., stimulation index ratio after depletion of CD14+ cells from PBMC and percent of proliferation inhibition following PMN addition to MLR). As shown in Fig. 3⇓, the inhibitory activity was directly correlated to the percentage of IL4Rα+ cells among PBMC (rP = 0.788, p = 0.001) but not among PMN (rP = 0.316, p = 0.446). When PBMC of cancer patients are considered, it should be noted that they fall into two main groups: one overlapping with the phenotype and characteristics of healthy donors (white dots), and the other with high expression of IL4Rα and immunosuppressive activity. 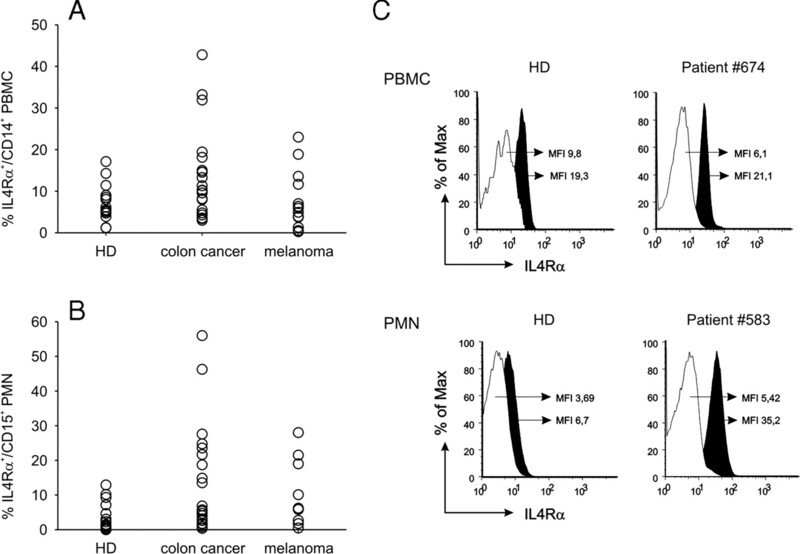 Correlation of immunosuppressive activity with IL4Rα expression. 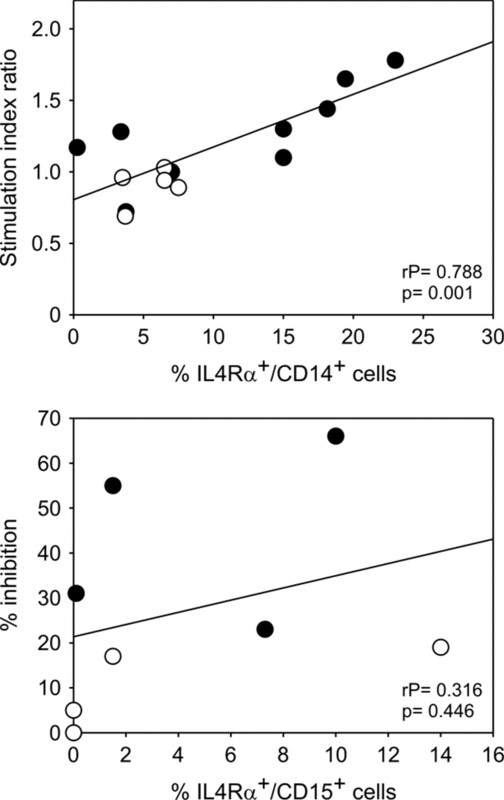 A, Correlation between stimulation index and percentage of IL4Rα+/CD14+ cells. Stimulating PBMC were obtained from healthy donors (white dots) or from cancer patients (black dots). B, Correlation between inhibition of MLR proliferation by addition of PMN of healthy donors (white dots) or cancer patients (black dots) vs percentage of IL4Rα+/CD15+ cells. To gain insight in the phenomenon of immune suppression exerted by CD14+ cells, we measured cell division by CFSE staining dilution in T cells stimulated with anti-CD3 mAb in the presence of CD14+ cells obtained from different donors. Specifically, we evaluated the effect of the addition of autologous CD14+ cells on the proliferation of PBMC depleted of CD14+ cells and stimulated by anti-CD3 mAb. In the representative experiment shown in Fig. 4⇓, responder lymphocytes were obtained from a healthy donor or from melanoma patient no. 278, whose CD14+ cells lack suppressive activity (stimulation index ratio 1 in MLR and 7% IL4Rα+/CD14+), or from melanoma patient no. 352, whose CD14+ cells had both phenotype and activity of MDSC (stimulation index ratio 1.78 and 23% IL4Rα+/CD14+). As expected, only the addition of CD14+ cells from patient no. 352 suppressed the responder T cell proliferation, with an increase in the percentage of cells in parental generation (from 16.9 to 59.2%) and a parallel decrease in the percentage of proliferating cells (from 83 to 41%). In contrast, the addition of CD14+ cells from the healthy donor or from the melanoma patient lacking suppressive phenotype induced an increase in the number of cells entering cell cycle (Fig. 4⇓). Cell division analysis of PBMC depleted of CD14+ cells and stimulated with OKT3. PBMC were labeled with CFSE, depleted of CD14+ cells and stimulated with OKT3, with (B) or without (A) autologous gamma-irradiated CD14+ cells added back at a ratio CD14−:CD14+ cells of 1:1. After 4 days, cells were harvested and stained with CD3. In the graph are shown CFSE+/CD3+ cells, blue peaks on the right indicate undivided (parent cells) and each peak toward the left-hand side represents one cell division or generation. The percentage of the cells in each division obtained are shown in the graphs. We then evaluated the expansion of myeloid cells in PBMC of melanoma and colon cancer patients by using mAb directed against CD14 and CD15. This analysis was performed in colon cancer patients (n = 19) and melanoma patients (n = 12) and compared with healthy donors (n = 20). In all instances, we observed an increase in the average frequency of CD14 and CD15 positive cells compared with healthy donors; moreover in colon cancer patients CD14+ cells were significantly higher than controls (p < 0.05; Fig. 5⇓, A and B). Flow cytometry analysis of myeloid cells in blood of healthy donors and cancer patients and in tumor tissues. PBMC were purified and stained as described in Materials and Methods and cells expressing the CD14 and CD15 myeloid markers were analyzed with CellQuest. CD14+ (A) and CD15+ (B) cells were evaluated in the PBMC-gated region. ∗, p < 0.05. Lines indicate mean values. Biopsy material from colon cancer patients (C) and melanoma (D) was disaggregated to single-cell suspension and labeled with a mAb directed against CD14. Representative example of CD14+/CD15+ cells in colon cancer (E) and adjacent normal colon mucosa (F). We also evaluated whether myeloid cells could be expanded at the tumor site. To this aim, tumor biopsies from eight melanomas and from nine colon cancer patients were dissociated into single cell suspensions, and cell populations were analyzed by flow cytometry to determine the percentage of myeloid cells. As shown in Fig. 5⇑, C and D, a significant increase in the percentage of CD14+-infiltrating cells was found among most tumors analyzed; all the CD14+ cells also expressed low levels of CD15 marker, as shown in the representative example of Fig. 5⇑, E and F.
One of the main characteristics of MDSC is their heterogeneous nature, and many authors advanced that MDSC do not represent a single cell population, but rather comprise different stages of immature myeloid cells functionally competent to bring about the control of activated lymphocytes. Several soluble factors produced by tumors are involved in myeloid cell expansion (12, 13, 14, 15, 16, 17), and might be responsible for the plasticity of myeloid precursors. Accordingly, there is evidence both in preclinical models and in cancer patients that MDSC share a phenotype with either monocytes or granulocytes (5, 8, 9, 18). To clarify the nature of MDSC in cancer patients, we analyzed different subsets of blood leukocytes, freshly isolated from cancer patients, including PMN that are generally lost during the freezing process. Our results show that myeloid cells with immunosuppressive properties can be found among monocytes and neutrophils circulating in peripheral blood of patients with colon cancer and melanoma. Interestingly, murine MDSC comprise two major subsets of Ly6G+Ly6Clow (mostly granulocytic) and Ly6G−Ly6Chigh (mostly monocytic) cells that can be found in different tumor models, and both fractions were shown to inhibit proliferation and IFN-γ release in T cells stimulated with the cognate Ag but not in T cells activated with polyclonal stimuli (18). Another open question regarding human MDSC is the definition of markers able to identify these cells. Our results show that IL4Rα is up-regulated in both myeloid populations but its presence correlates with an immunosuppressive phenotype only when PBMC, but not PMN, of tumor-bearing patients are considered. However, due to technical limitations, we could only test for a correlation between expression of this marker and the immune response. Indeed, sorting of a pure IL4Rα+ population was hampered by the low expression of this Ag which resulted in a shift of the intensity in the positive cell fraction instead of a distinct separation from the negative population. A recent analysis showed that IL4Rα was expressed in both granulocytic and monocytic fraction of mouse MDSC (18); the increase in IL4Rα+ cells among MDSC was statistically different in two tumor types of ten, as compared with myeloid cells found in tumor-free mice, even though a tendency to such an increase was visible in the majority of tumors analyzed. Changes in mean fluorescence intensity were not evaluated, making a real comparison with our data not feasible; nonetheless, overall results seem to suggest common features between mouse and human MDSC. At the moment, it is not clear whether the cell subsets sharing IL4Rα marker are either in equilibrium or one cell type can evolve in the other. Some evidence suggests that mature granulocytes are indeed less committed than expected, because human neutrophils can “transdifferentiate” into dendritic cells in the presence of GM-CSF, IL-4, and TNF-α (19), whereas mouse and human granulocytes can differentiate into macrophages expressing a functional receptor for CSF-1 (20, 21). Mouse undifferentiated hematopoietic cell lines (22) and acute monocytic leukemia of M5 type (S. Mandruzzato, unpublished data) express high levels of IL4Rα, therefore, another explanation for the common expression of this Ag could be that circulating leukocytes bearing this receptor are immature myeloid cells common to both monocytic and neutrophilic differentiation pathways. These cells, however, are distinct from more immature elements described previously in the blood of cancer patients (4), which are another sign of the enhanced myelopoyesis in tumor-bearing hosts. Our work sheds some light on conflicting results that have described MDSC either as monocyte- or neutrophil-related cells. Indeed, in most studies in which MDSC were investigated, only PBMC were used. In fact, these cells can be frozen and analyzed later, while PMN have to be used readily after isolations, because freezing results in extensive death; moreover, in vitro culture, although possible for a short period, is constrained by the short granulocyte life-span and by their easy activation by nonspecific stimuli. Our results, however, demonstrate that cells with phenotypic and functional characteristics of MDSC are also present in the granulocyte fraction. Zea and collaborators (5) described a population of cells bearing markers and morphology of polymorphonuclear cells but expanded in the monocyte fraction of patients with renal cell carcinoma. Indeed, it has already been reported that activated granulocytes can copurify with PBMC, probably as a consequence of their activation status changing their density (23). However, alternative explanations might exist in agreement with the plasticity of MDSC found in mice. MDSC, in fact, can differentiate into dendritic cells, macrophages and possibly endothelial cells according to the external stimuli they receive (reviewed in Refs. 2 and 3). The cells we found in PBMC and PMN might thus be stages of the same differentiation pathway driven by tumor-derived factors rather than truly different cells. We thank Dr. A. Corradin for support in statistical analysis. The help of P. Gallo and S. Valpione for artwork preparation is also gratefully acknowledged. Many thanks to Dr. V. Tosello for helpful discussions and suggestions. ↵1 This work was supported by grants from Associazione Italiana per la Ricerca sul Cancro (AIRC), project RSF/2005/R/5 from Fondazione Italiana Sclerosi Multipla (FISM), Progetto di Ricerca di Ateneo 2006, and Azione Biotech, Regione Veneto. ↵4 Abbreviations used in this paper: TAA, tumor-associated Ag; MDSC, myeloid-derived suppressor cell; ARG, arginase; PMN, polymorphonuclear cell; IL4Rα, α-chain of the receptor IL-4. Mocellin, S., S. Mandruzzato, V. Bronte, M. Lise, D. Nitti. 2004. Part I: vaccines for solid tumours. Lancet Oncol. 5: 681-689. Rabinovich, G. A., D. Gabrilovich, E. M. Sotomayor. 2007. Immunosuppressive strategies that are mediated by tumor cells. Ann. Rev. Immunol. 25: 267-296. Marigo, I., L. Dolcetti, P. Serafini, P. Zanovello, V. Bronte. 2008. Tumor-induced tolerance and immune suppression by myeloid derived suppressor cells. Immunol. Rev. 222: 162-179. Almand, B., J. I. Clark, E. Nikitina, J. van Beynen, N. R. English, S. C. Knight, D. P. Carbone, D. I. Gabrilovich. 2001. Increased production of immature myeloid cells in cancer patients: a mechanism of immunosuppression in cancer. J. Immunol. 166: 678-689. Zea, A. H., P. C. Rodriguez, M. B. Atkins, C. Hernandez, S. Signoretti, J. Zabaleta, D. McDermott, D. Quiceno, A. Youmans, A. O'Neill, et al 2005. Arginase-producing myeloid suppressor cells in renal cell carcinoma patients: a mechanism of tumor evasion. Cancer Res. 65: 3044-3048. Munder, M., F. Mollinedo, J. Calafat, J. Canchado, C. Gil-Lamaignere, J. M. Fuentes, C. Luckner, G. Doschko, G. Soler, K. Eichmann, et al 2005. Arginase I is constitutively expressed in human granulocytes and participates in fungicidal activity. Blood 105: 2549-2556. Munder, M., H. Schneider, C. Luckner, T. Giese, C. D. Langhans, J. Fuentes, P. Kropf, I. Mueller, A. Kolb, M. Modolell, A. Ho. 2006. Suppression of T cell functions by human granulocyte arginase. Blood 108: 1627-1634. Filipazzi, P., R. Valenti, V. Huber, L. Pilla, P. Canese, M. Iero, C. Castelli, L. Mariani, G. Parmiani, L. Rivoltini. 2007. Identification of a new subset of myeloid suppressor cells in peripheral blood of melanoma patients with modulation by a granulocyte-macrophage colony-stimulation factor-based antitumor vaccine. J. Clin. Oncol. 25: 2546-2553. Hoechst, B., L. A. Ormandy, M. Ballmaier, F. Lehner, C. Kruger, M. P. Manns, T. F. Greten, F. Korangy. 2008. A new population of myeloid-derived suppressor cells in hepatocellular carcinoma patients induces CD4+CD25+Foxp3+ T cells. Gastroenterology 135: 234-243. Diaz-Montero, C. M., M. L. Salem, M. I. Nishimura, E. Garrett-Mayer, D. J. Cole, A. J. Montero. 2009. Increased circulating myeloid-derived suppressor cells correlate with clinical cancer stage, metastatic tumor burden, and doxorubicin-cyclophosphamide chemotherapy. Cancer Immunol. Immunother. 58: 49-59. Gabrilovich, D., T. Ishida, T. Oyama, S. Ran, V. Kravtsov, S. Nadaf, D. P. Carbone. 1998. Vascular endothelial growth factor inhibits the development of dendritic cells and dramatically affects the differentiation of multiple hematopoietic lineages in vivo. Blood 92: 4150-4166. Pan, P. Y., G. X. Wang, B. Yin, J. Ozao, T. Ku, C. M. Divino, S. H. Chen. 2008. Reversion of immune tolerance in advanced malignancy: modulation of myeloid-derived suppressor cell development by blockade of stem-cell factor function. Blood 111: 219-228. Rodriguez, P. C., C. P. Hernandez, D. Quiceno, S. M. Dubinett, J. Zabaleta, J. B. Ochoa, J. Gilbert, A. C. Ochoa. 2005. Arginase I in myeloid suppressor cells is induced by COX-2 in lung carcinoma. J. Exp. Med. 202: 931-939. Serafini, P., R. Carbley, K. A. Noonan, G. Tan, V. Bronte, I. Borrello. 2004. High-dose granulocyte-macrophage colony-stimulating factor-producing vaccines impair the immune response through the recruitment of myeloid suppressor cells. Cancer Res. 64: 6337-6343. Sinha, P., V. K. Clements, A. M. Fulton, S. Ostrand-Rosenberg. 2007. Prostaglandin E2 promotes tumor progression by inducing myeloid-derived suppressor cells. Cancer Res. 67: 4507-4513. Talmadge, J. E., K. C. Hood, L. C. Zobel, L. R. Shafer, M. Coles, B. Toth. 2007. Chemoprevention by cyclooxygenase-2 inhibition reduces immature myeloid suppressor cell expansion. Int. Immunopharmacol. 7: 140-151. Youn, J. I., S. Nagaraj, M. Collazo, D. I. Gabrilovich. 2008. Subsets of myeloid-derived suppressor cells in tumor-bearing mice. J. Immunol. 181: 5791-5802. Oehler, L., O. Majdic, W. F. Pickl, J. Stockl, E. Riedl, J. Drach, K. Rappersberger, K. Geissler, W. Knapp. 1998. Neutrophil granulocyte-committed cells can be driven to acquire dendritic cell characteristics. J. Exp. Med. 187: 1019-1028. Araki, H., N. Katayama, Y. Yamashita, H. Mano, A. Fujieda, E. Usui, H. Mitani, K. Ohishi, K. Nishii, M. Masuya, et al 2004. Reprogramming of human postmitotic neutrophils into macrophages by growth factors. Blood 103: 2973-2980. Sasmono, R. T., A. Ehrnsperger, S. L. Cronau, T. Ravasi, R. Kandane, M. J. Hickey, A. D. Cook, S. R. Himes, J. A. Hamilton, D. A. Hume. 2007. Mouse neutrophilic granulocytes express mRNA encoding the macrophage colony-stimulating factor receptor (CSF-1R) as well as many other macrophage-specific transcripts and can transdifferentiate into macrophages in vitro in response to CSF-1. J. Leukocyte Biol. 82: 111-123. Ohara, J., W. E. Paul. 1987. Receptors for B-cell stimulatory factor-1 expressed on cells of haematopoietic lineage. Nature 325: 537-540. Schmielau, J., O. J. Finn. 2001. Activated granulocytes and granulocyte-derived hydrogen peroxide are the underlying mechanism of suppression of t-cell function in advanced cancer patients. Cancer Res. 61: 4756-4760.